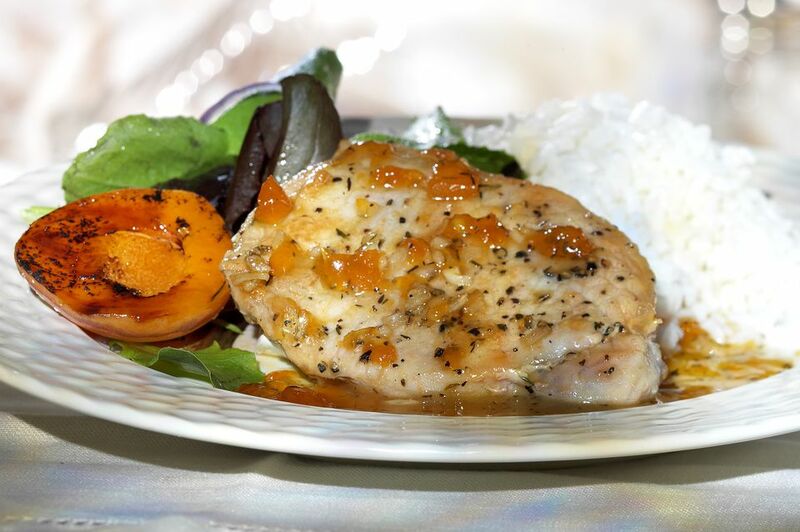 This kosher apricot chicken recipe is so simple and so good that it can become your family's go-to Shabbat lunch recipe quick. It's a saucy dish is moist enough to serve the day after it's baked—perfect for Shabbat—and so easy to prepare. It also makes a good dinner for busy weeknights. Just mix the marinade in the morning and let the chicken marinate in the fridge all day. When you get home from work, pop the dish in the oven, and prep your favorite sides or help with homework, do laundry, or any number of things while you wait for the chicken to cook. Oil a 13x9x2-inch or similarly sized baking dish. Arrange the chicken pieces in a single layer in the dish, and sprinkle generously with the paprika. In a small bowl, mix the apricot jam, mayonnaise, garlic powder, and pepper. Pour the sauce evenly over the chicken. Cover the baking dish with aluminum foil, place in the refrigerator, and let the chicken marinate for a few hours or overnight. Heat the oven to 350 F/180 C. Place the covered baking dish in the oven and bake the chicken for 45 minutes. Uncover the dish and bake for another 30 to 45 minutes, or until the chicken is lightly browned and cooked through. For a weeknight meal, roast some baby potatoes while the chicken cooks, and make these quick green beans with pecans and date syrup. If you want to offer a wider selection of sides for a Shabbat meal or party, try this rainbow slaw, some delicious roasted broccoli with ginger, and Israeli couscous with cherries and pine nuts. For dessert, offer a crowd-pleaser like the ultimate pareve chocolate cake.